Traveling with a cat brings anxiety to almost all owners, luckily with the Sherpa Deluxe Pet Carrier on hand, you can keep them feeling secure and comfortable. Traveling with a pet in a carrier is often a stressful experience at best. While some cats manage traveling quite well, others can be extremely nervous. They can kick up quite a fuss in carriers and leave you feeling guilty for putting them through it. 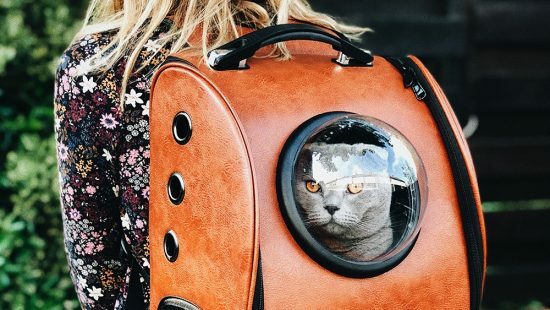 Armed with one of the best cat carriers for nervous cats, you can ease some of the anxiety that cats feel in strange surroundings. Purchasing a comfortable, sturdy cat carrier designed for traveling cats made with the best materials can make all the difference. After much deliberation, we’ve decided that the best carrier for nervous cats is the Sherpa Deluxe Pet Carrier. 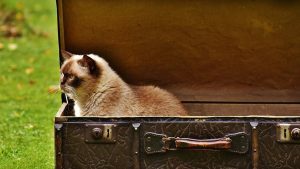 In this article we’re going to take a look at the best closed traveling carriers for cats that are suitable for air travel as well as car travel and tell you why we like them. Because different airlines have different rules, we’ve listed the size of each of our favorite cat carriers in the table below. Our reviews and ratings are based on a healthy mix of personal experience and consumer reports from around the web. We also do our best to take value for money into account when deciding on the best cat carrier for traveling with nervous cats. It’s not always the case that more expensive options are worth purchasing, so we feel value is a really important factor. Time to take a closer look at each of the products listed in the table above. Below is a list of the best cat carriers for nervous cats that are guaranteed to help keep your cat calm. The Sherpa Deluxe Pet Carrier remains a solid go-to choice for good reason, it’s extremely good value for money and comfortable for pets. Best recommended for pets up to 22lbs, this carrier is capable of happily housing a cat with plenty of room for movement. It’s the most spacious carrier we’ve used and having that little extra legroom seems to go a long way towards keeping cats calm. You can unzip the top and lower your cat into the carrier without too much resistance, it’s so much easier than getting them in through the side doors. Saves about 30 minutes of wrestling and an arm full of scratch marks! It has a super fluffy mat inside that seems pretty resistant to spills, but you might want to bring a replacement along with you. It’s definitely up there as one of the best pet carriers we’ve ever tried. Airline approved, comfortable and secure. The Pawfect Pets Travel Carrier ticks all the boxes for nervous traveling cats and is one of the best cat carriers around. It’s snug enough to fit on most major airlines as cabin luggage, but leaves enough room for your cat to be able to move around a little which is definitely for the best. The “claw-defense mesh” is durable and doesn’t feel flimsy at all, no risk of tears or holes here. The zips have mini-buckles on them to ensure they don’t come loose and give your pet a chance to escape mid flight. The handle is comfortable and it’s a nicely balanced as far as weight goes. We’ve had trouble in the past where our cat would curl up in one side and tilt the whole thing, making it really difficult to carry using the top handles. This case is sturdy enough that we saw no such problems here. It also comes with two fleece padded mats of the best quality, which means you can quickly replace the flooring if there any spills or accidents. It’s made the top end of our list simply because it’s the first travel carrier we’ve ever used that addresses all our annoyances with previous carriers. They really have thought of everything. This stylish looking soft sided pet carrier is perfect for those looking for a smaller pet carrier that’s suitable for airline travel. Recommended for pets up to 14lbs, it should comfortably accommodate your cat and leave a bit of room for movement. It’s super lightweight at only 2.7lbs and the mesh is a really high quality. The only downside is that because it’s so light it can be difficult to balance a disgruntled cat and carry it using the top handles, we found it best to use the shoulder strap in most cases. Other than it’s a great all rounder and definitely worthy of a place on our best cat carrier list. This plastic and steel carrier is as sturdy as they come. You might sacrifice a little style but plastic carriers are definitely more convenient to use in a general sense. They’re sturdy, secure, and allow for top loading. Cleaning up spills is as easy as replacing the mat inside and giving it a quick wipe over. With plastic carriers you can sometimes feel that the hinges on the doors are a bit flimsy and insecure. 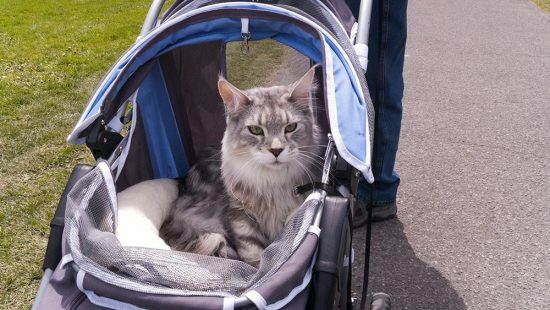 This Petmate cat carrier has no such trouble. One of it’s best features is that the hinges are strong and there’s no wobbling or looseness, so you can rest easy knowing your cat isn’t about to burst out and do a runner! The best plastic pet carrier we’ve ever had the pleasure of using. We love how convenient the SportPet Travel Cat Carrier is. It has a wide side-opening door that makes for the easiest side-loading we’ve encountered. Our cat was even comfortable enough walking into the case from the side as it looks so open and inviting. Pretty much the biggest relief ever. It folds down easily and is super compact, making it the best choice for a carrier that needs packing away when it’s not required. Take a quick look at some of the raving reviews this carrier has had by clicking the button above. Choosing a comfortable carry crate for your cat is important and hopefully our list above has given you some worthy options to choose from. Cats often aren’t too keen on being put in cages, but many cats soon grow accustomed to being temporarily held in a cage. If you do purchase a new carrier, it’s vital that you give your cat an opportunity to become accustomed to it. Try leaving it out and open in a place where the cat is already comfortable, and give them time to get used to it. You’ll be surprised to find that cats will quickly find themselves at home in the case and be will even happily sleep in there while it’s open. If you think they’re still a little suspicious due to past experiences, it can be a good idea to tempt them in with some treats. Don’t slam the door as soon as they get in, but let them enter and leave freely until you can tell they’re totally comfortable with the new carrier. There’s even whole host of catnip blankets and the like designed to keep cats calm. It’s definitely something worth looking into. Make sure you give your cat plenty of attention. Stroke them through whatever openings your carrier has and try to give them as much contact as you possibly can. You’ll definitely want to, but do not partially unzip the carrier in a public place, it’s tempting (we know!). Hold the case as close to your body as possible so they can feel your body moving, and if you have a carrier with privacy flaps to cover up some of the mesh then utilize them. 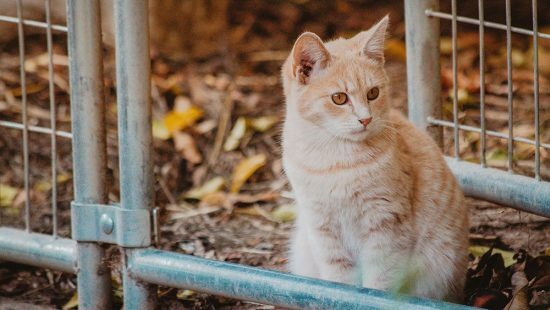 If you’ve tried everything and don’t seem to be getting anywhere, it can be a good idea to prepare with some natural cat-calming solutions as a last resort. Make sure there aren’t any drugs or nasty chemicals in them, and remember that it’s better to try other methods before resorting to food and treats. Nervous cats can be prone to urination. It can create a really unpleasant odor that’s hard to get rid of. We recommend you travel with scented wipes and make sure your carrier has a suitable pad on the floor. 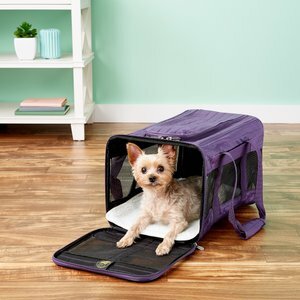 You want to make the carrier resemble a comfortable cat bed as much as possible, so use removable linings that are easy to wash and soak up any spills. It might also be a good idea to travel with zip lock bags containing cat litter, just to soak up any mess you may not be able to wipe away in a hurry. We’d recommend you use a clumping cat litter, as those are best suited to sealing in odors to minimize nasty smells! We took this into account when creating our recommendations for the best cat carriers. It’s one of the reasons we listed the Pawfect Carrier as the best carrier for nervous cats. The replacement fleece mat that comes with the carrier makes it a breeze to swap during travel. Ensure that you purchase a reliable cat carrier made from quality materials that won’t fall apart easily. 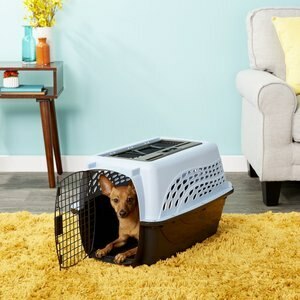 This doesn’t necessary have to be to the same extreme that durable dog crates are made, since your cat can’t really exert that much force on the walls of the carrier. Just be sure that the zips are sturdy and the bottom of the carrier will comfortably hold their weight. Cases with thick strong handles are a good bet since dropping the carrier at any point is likely to cause serious distress and make things even more difficult in future.